Take your production, product messaging, or display to a whole new level with a professional truss. Each piece of our aluminum box truss weighs less than 20 lbs., making it ideal for DJs, trade shows, and mobile shows. Spans up to 2 meters across will support up to 500 lbs. center loaded and even more when evenly loaded. The 8" x 8" frames are easy to transport and dolly load for truck packs. The 1.5" outer tubes are convenient for mounting lights, TV monitors, and signage. It is not recommended for speakers or human harnesses. Losing a bag of truss spigots can mean the death of a show. Do not worry about losing or damaging connecting hardware, since our bolt truss uses standard over-the-counter M10 hex bolts available at any hardware store. 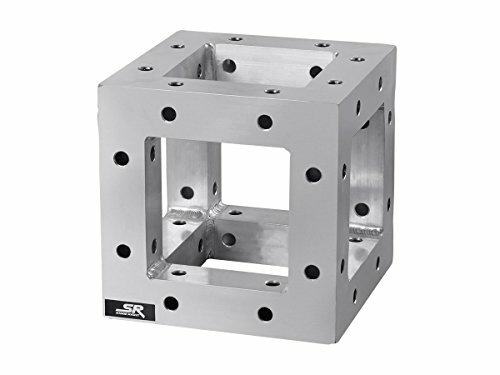 This Stage Right 8" x 8" Aluminum Bolt Truss system is available in several sizes. Simply plan your floor space and take advantage of the versatility of the universal 6-way corner to build arcs, projector screen frames, or complete multi-layer booths complete with warmers and signage. If you have any questions about this product by Stage Right, contact us by completing and submitting the form below. If you are looking for a specif part number, please include it with your message.